Should I Rent a Hot Water or Cold Water Pressure Washer? 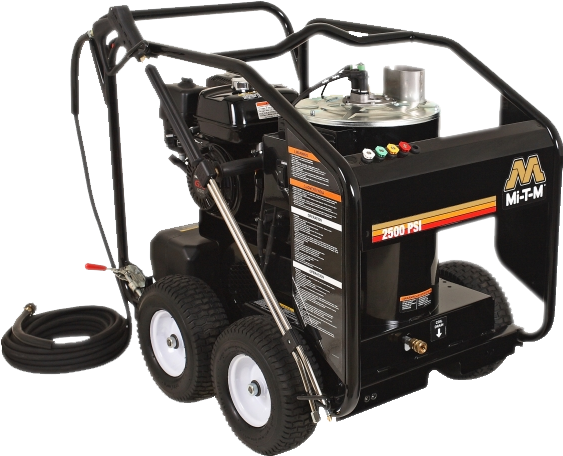 A pressure washer (power washer) machine is the the ideal way to clean large surfaces quickly and efficiently. Typical rental pressure washers range in power from 3,500 psi to 4,000 psi and are powerful enough to handle the toughest and dirtiest of jobs - like stripping years of grime from metal, peeling loose paint from wood, cleaning gutters, scouring garbage cans, revitalizing wooden decks, and cleaning those stubborn BBQ grills. These high-powered models can also be used to clean bridges, construction vehicles, equipment, building facades and more. 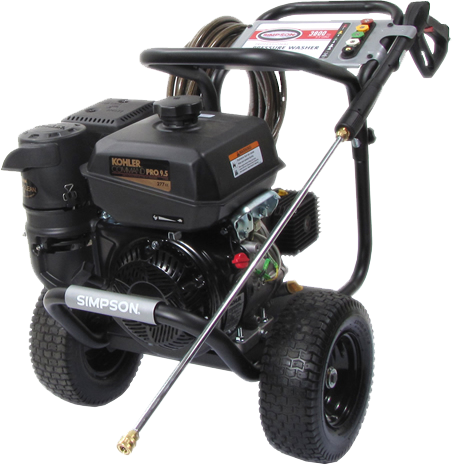 Psi's aside, the most important factor when choosing a pressure washer for rent or purchase is whether to opt for hot or cold models. Pros: Cold water pressure washers are generally the cheaper option. They are also somewhat less effective then hot water pressure washers. In terms of cost, both initial and maintenance, they are cheaper than their hot water counterparts. They also tend to be significantly smaller and lighter, making them ideal for confined spaces or when maneuverability is a factor. Cons: These machines are slightly less efficient and lack the ability to remove grease and oil as well as hot water pressure washers. If you will be handling oily jobs like cleaning grills or engine work, these machines may not be the right tool for your job. Uses: Anything that does not involve oil or grease like removing mud, sand, stripping paint, etc. Pros: The best analogy for understanding the difference between hot water and cold water pressure washers is the difference between washing dishes in hot vs. cold water. Try to wash dishes with only soap and cold water and you'll be left with a film of grease that's tough to make disappear. Greasy pipes and oily concrete are the same way. Without extremely hot water, you'll never remove that final layer of oily residue. Hot water pressure washers do more than battle greasy, oily clean-up jobs. Hot water pressure washers can heat up water to up to 200 degrees Fahrenheit, disintegrating muck and grime while producing hot steam ideal for killing germs. They are generally the best machine for getting any job done both quickly and thoroughly. Cons: These units are more complex and therefore larger and more difficult to move around. They also require more maintenance and have a higher base price. Uses: Projects tackling grease and oil like engine work, food related jobs, and piping. For more information, or to rent or buy a hot or cold pressure watcher, please call us at 1-800-DURANTE.